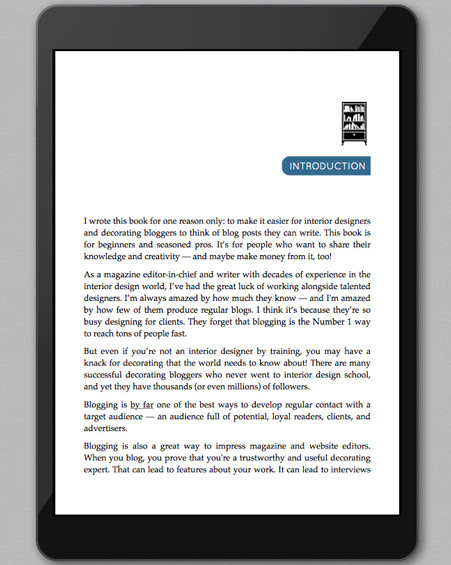 With this book in hand, decorating bloggers and interior designers can write interior design blog posts easily. Great for beginners and pros! You get 550 Q&A prompts. Readers, magazine editors, and future clients get 550 fantastic ideas from you! 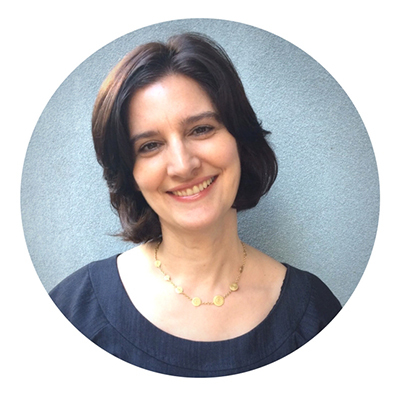 I’m a pro interiors blogger and former magazine editor in chief with more than 20 years of experience writing, editing, and producing interior design articles. There are 550 questions that you can turn into Q&A blog posts! Readers are already asking these questions all over the Internet. Just follow my step-by-step process for putting these ideas to work on your interior design or decorating blog. >>Click on this link to find out more about all the magazines and websites I’ve written for. Please note: This item is delivered digitally as an EPUB file and is not a physical product. You can read it on any digital device, or download and print it. That means you can take it with you everywhere you go. 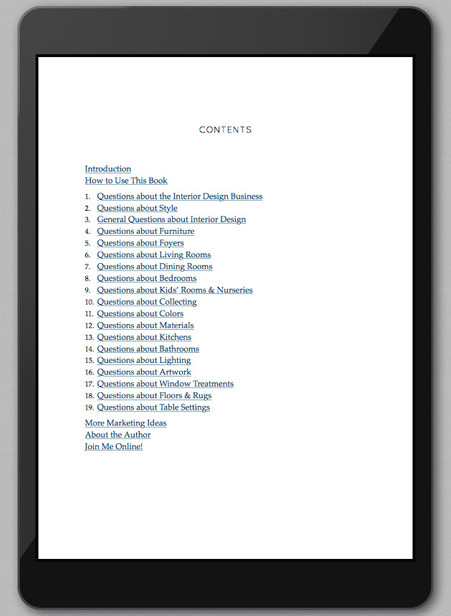 For step-by-step instructions on how to read an EPUB on your device, computer, or the Web, read this post I wrote. I scoured the Internet for the questions homeowners ask interior designers. So you can be confident knowing these will interest readers. With these blog posts, you can prove to editors they should be calling you for interview quotes and features! Every time you answer one of these questions, you can add in details about projects you’ve worked on. That’s great marketing. From furniture layouts and bedroom decorating, to the best ways to light your dining room, you’re sure to impress clients with these blog posts. The next time potential clients ask you about things like budgeting and purchasing, point them to these posts. The more readers understand about interior design, the more you can focus on impressing them with your projects. Blogging is the best way to tell people about what you know and what you've worked on. Are you just starting your interior design blog? Do you already have a blog, but you’re stuck on what to write next? This book is for you! You can stop trying to think up blog post topics and just flip to the Table of Contents! 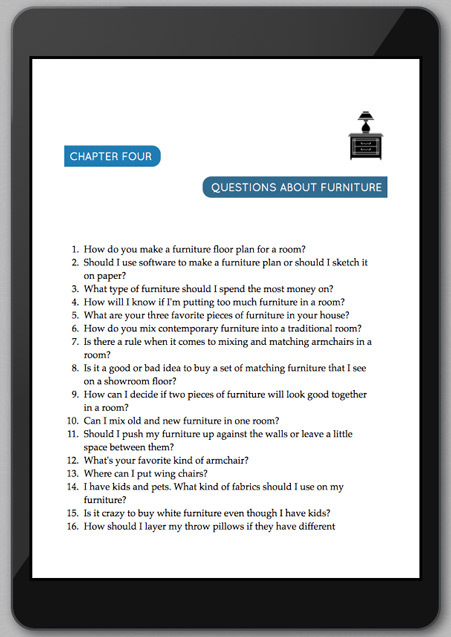 Each chapter dives right in so you can pick a question easily. In the mood to write about tabletop settings? Got a new kitchen project that you want to share? 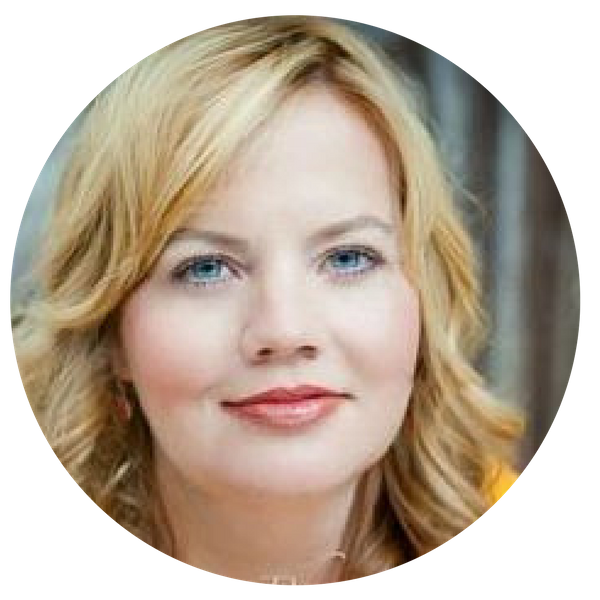 By turning it into a Q&A blog post, you can show readers that you’re a Very Helpful Designer, and they will love you more for it. All you have to do is imagine that a client (or potential client) is asking you the question and write your answer. WHY WAIT? BUY NOW AND GET STARTED BLOGGING. Why put off taking your interior design business to the next level? 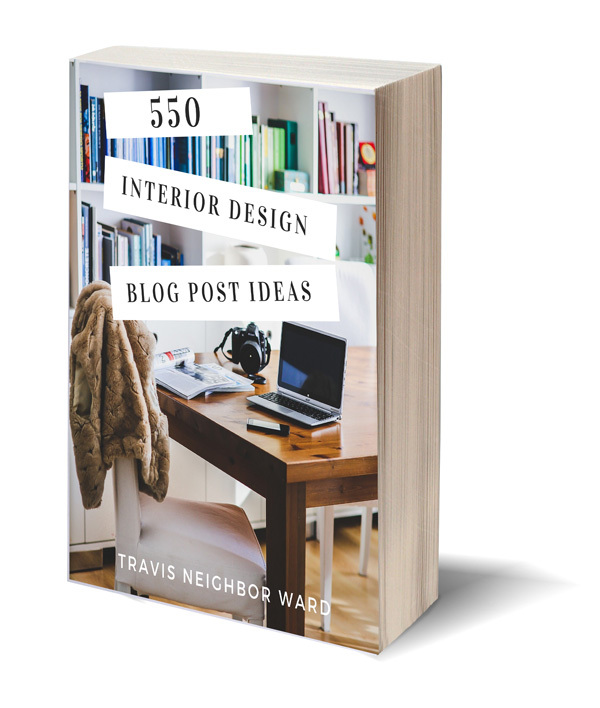 You can buy 550 INTERIOR DESIGN BLOG POST IDEAS now for only $27. That’s less than the cost of dinner at a nice restaurant. Have you joined The House Publishing Club yet? Share this page with friends using the buttons below!